A merely 10 minutes read – Serious bloggers would leave everything else they’re doing now and read this blog instead. We are using these methods and seeing some dramatic improvements in ranking trend. You too can use them to improve, sustain your blog rank in the Alexa ecosystem! Read on, for any query you think we need to clear, or for any information input, do not hesitate to comment! Upon entering How to improve ale – Google auto-suggested so many commonly asked queries. That tells how many people search the term and why Alexa is so important. If you are still thinking the authenticity of Alexa, here’s more proof just type how to improve Alexa ranking. Alexa.com is a subsidiary of Amazon.com. The algorithm Alexa follows in ranking a website is simple – It is calculated based on the amount of traffic to a website from users who have Alexa toolbar installed. Having said that, people who do not have the toolbar are not included in the traffic analysis. There are a good number of blogs detailing a comprehensive strategy about how to improve your blog’s Alexa ranking. While most of them are the good to read, we will tell you the actual strategies we have seen work. Please note if you follow the process we are detailing, and maintain the best practices, it is a likely fact that Alexa rank will improve. Having said that we think a little disclaimer is important – We do not guarantee these tricks and tips always work since algorithms for ranking variation change, but the way the ranking is calculated now if you follow the strategies, we can say we sure your ranking will improve. These tips are beneficial not just improving your Alexa ranking, these are indeed helpful for improving your overall ranking in SERP – search engine results from pages. 2 Does Alexa ranking of your blog hold value for your web presence? 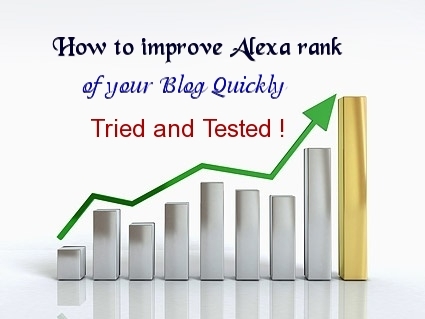 5 How to improve your Alexa ranking or how to increase Alexa ranking of your blog? Writing quality guest blogs helps you build a base of quality backlinks. If you write blogs on authentic websites that get visited by people, your Alexa rank will improve. Alexa also calculates the reputation of your blog by calculating how many quality backlinks you are receiving. You can also do comment on niche blogs and thereby generate new backlinks. Although these techniques help, if you write poor quality content on guest blogs, you can expect zero results. So, at the end, it is about writing quality content! To improve your Alexa ranking, an important thing is to update your blog often. If you post once in a while, generating traffic is not viable. If you update regularly, your website is crawled regularly and you get a constant pool of traffic thereby generating better ranking at SERP and improving your Alexa ranking. If you are new to blogging, post regularly. If you are an established blogger, update your blog but maintaining a very strict schedule is not very important. You install the widget on your blog from Alexa.com website. Just register your blog on Alexa and paste the code on your blog. An Alexa widget tells your visitors about the ranking, and it even tells you about traffic coming from Alexa. Some people doubt the authenticity of the tips, but if Alexa has made this facility available, there must be some reason. Do ON PAGE SEO and OFF PAGE SEO for your blog. Find keywords that drive traffic to your site and maintain a holistic keyword ranking strategy. Ask people to write guest posts on your blog. These are some of the important tips you can integrate on your blog to start getting results from Alexa.com. As we said earlier, it is about writing quality content that matters for Alexa. If your blog is of quality and you populate it with good quality articles, your Alexa ranking will improve. Bonus tips to improve Alexa rank of your Blog Quickly – Hire guest bloggers to write quality content for your blog. It is good to hire a professional blogger and ask him/her to write on a regular basis besides posting some on your behalf on niche guest blogs. Does Alexa ranking of your blog hold value for your web presence? To list on your blog ranking, you should act carefully to improve. This article details the crucial factors you want to improve or increase your Alexa ranking. To improve on your blog Alexa ranking, you should list your ideas and then rank your website. Without a valid technique and manipulating rank, how you blog to rank well? Consider reading this article, and for any info; please ask. As you have already read our above content – How to improve your Alexa ranking of your blog quickly to get a background understanding. To save on time, and want to directly find an answer to the question we asked in the title, read on! There are two dissimilar schools of thought when it comes to answering this question. One that says Alexa is a crucial part of your SEO campaign and the other that says Alexa is overly hyped and it is not the vital factor that pushes up your ranking. Although there are reasons and judgments behind each belief, we believe we should tell you what we think, backed by evidence and case studies. Read on, if you think we need to clear on some points or if you want to tell us your innate views about the matter, please let us know in the comments section. Thank you! If you are already aware of Alexa ranking, it is nice! If you are new to it, here’s what Alexa ranking is – Alexa is a subsidiary of Amazon. It provides commercial web traffic data and analytics. The company was founded in 1996 and later acquired by Amazon in 1999. It ranks website and evaluates traffic data depending on the number of traffic website. So, better a website gets traffic, better it ranks. Some anti-virus software flag Alexia’s toolbar as malware, adware while some flag it as green, albeit with some restriction. Some webmasters disregard Alexa by saying only people who’ve installed it on their browser and have the codes integrated on their website pages can participate in the ranking algorithm ecosystem. Which means people who run their website without it, are not participating. This is a problem with Alexa and hence can be said it is not a whole form of traffic analysis. However, since Alexa has become a popular form of data interpretation, it should be regarded that the toolbar actively plays an important role in calculative traffic generation and that the traffic generated from it is very important in terms of lead generation, and thereafter ensuring a developed web presence. Web sites with good Alexa ranking achieve good traffic, ranking and trust of webmasters and website visitors. So, having a good ranking in Alexa is the really crucial part. 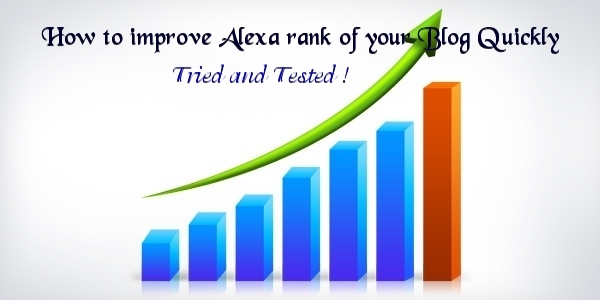 How to improve your Alexa ranking or how to increase Alexa ranking of your blog? To get a good Alexa rank, one crucial point is to write quality content that scores well in search engine results pages. The better your content is, the better is the SERP. That means traffic on a website improves or increase with good quality content. And when traffic is the increase, it is natural for you to score well in rank. How to manage, maintain and leverage your content on your website? Besides the content part, another important thing that you need to consider is the SEO thing. Writing custom content and then linking with good websites or blog that are into your domain is important. You need to get links from credible websites. The better you rank, more chance for improving your SEO becomes. So, it is important for you to link well. So, doing the better work, it is important for you to ensure that your website scores well in the Alexa ranking. We have seen blogs that were doing well despite Alexa ranking importance, but post installing the toolbar; the blogs were becoming really better in terms of generating blog traffic. So, we need to say that Alexa is crucial for improving or increasing your blog traffic and that you should think about it. If you need an assistance of a professional search engine guide who can help you with improving your Alexa ranking, you can ask for help. But we recommend you do it on your own. Blog Alexa ranking improvement depends on the quality content of your blog. The tips to improve blog Alexa ranking is not rocket science. Just practice these tips to increase traffic to your blog and see results in Alexa ranking! Thanks for reading the blog. If you want guidance and free but helpful advice on how to improve your ranking in Alexa, you can visit the blog that hosts the info. You can read the free resources listed on our blog. But before investing money on a solution you can get free of cost, why not try out the free stuff? If you require any sort of assistance on your increasing Alexa ranking, ask us. If you want to read other important variety of fact about how to score well, you can read our earlier article.If you have any questions or suggestions, please comment on the blog. Digital SEO Guide helps you read, learn and practice SEO tips and ideas besides digital marketing ideas. Come to our blog to stay tuned what’s latest in the digital marketing world. You can contact us for any suggestions – be it a digital course on improving your website rank on SERP or a course on any general course! Very nice i am really like this improve alexa ranking article, after reading this i also install the Alexa rank widget on my blog. Very nice i am really like this improves alexa ranking info. Keep updating. Good job. I used to be addicted to my Alexa ranking…no kidding :)! I was like checking it multiple times per week and working hard to get it below 100K. I even had the Alexa browser toolbar installed haha ? On the Digitalpoint forums people were selling services to improve your Alexa ranking. Oh those were the days ? Now I find Alexa pretty irrelevant. Is alexa rank that much important for bloggers? Compared to last month, I am getting more traffic and a unique visitors this month for my site, Even I am using Alexa toolbar and Alexa widget. But unfortunately, I am loosing Alexa rank continuously from the last 15 days. What will be the reason behind this? How can I improve Alexa rank to my website? Alexa rank matters, if you want to attract advertisers for your website or blog. If your Alexa rank is dropping wait for some days maybe this all happen temporarily.